1. 7 year pens - Sometimes even the smallest things can give a hint of your personality. That's beauty of design- and of these 7 year pens! 2. USB Cord- We use them for everything, might as well get pretty ones, right? 3. Puffin Card - I've a weakness for Puffins and here a crazy bird mixes with the dignity of gold foil. Sigh! Perfection. 4. Dog Stapler- I'm not sure if it is the most practical stapler I've ever encountered, but who cares- put a dog on it, man! 5. Notepad - To Do Lists are always more fun on pretty paper. 7. Pig Bookend- There's been a few famous pigs in literature- Wilbur of Charlotte's Web foremost in my mind- but let's face it,, golden, bookend pigs are both charming and also really, really weird. The pens and the stapler really caught my eye. Now if only they had the stapler in a pug version! 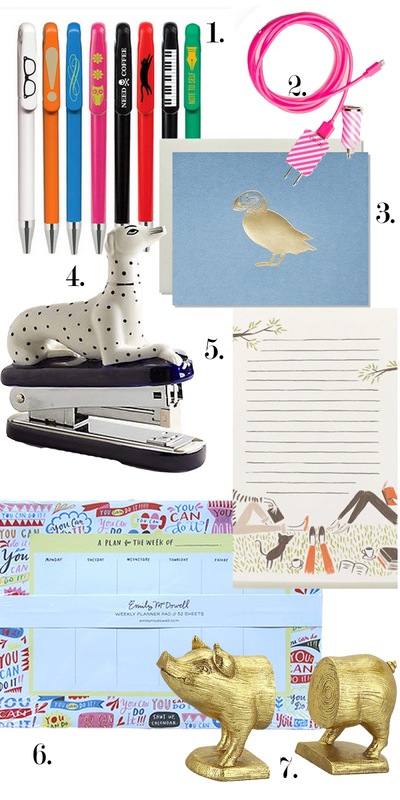 The dog stapler is so adorable!